Development of the writing system in ancient Egypt was different than in Mesopotamia. The earliest example of ancient Egyptian hieroglyphic script dates from about 3100 BC but scholars believe that ancient Egyptians started to write much earlier. However, in contrary to Sumerian cuneiform script which developed from pictographs (picture drawing) there is no evidence that similar process took place in Egypt as well. It is also very unlikely that the Egyptian hieroglyphs were influenced by the cuneiform script because both scripts base on different writing systems. Thus the origin of the ancient Egyptian hieroglyphs remains unknown except that Thoth (god of moon and of wisdom, knowledge and writing typically presented as ibis-headed man) is credited with the invention of writing. Hieroglyphs (from the Greek word for sacred carvings) consist of three kinds of glyphs: logographs (signs representing both meaning of the picture and the symbol of a sound), phonetic glyphs (characters which represent the sounds) and determinatives (signs which help to disambiguate the meaning of logographs and word division). 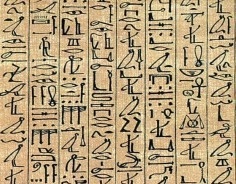 Hieroglyphs are usually written left to wright but sometimes also left to right, from bottom to top and from top to bottom. The reader can easily determine how to read ancient Egyptian hieroglyphs by direction of human faces and animals. For example if they look to left the text must be read from left to right. In contrary to Mesopotamian scribes who predominantly wrote on clay tablets, ancient Egyptians mostly used papyrus scrolls which were at the time very expensive. For that reason ancient Egyptian scribes often reused the papyrus after deleting the old texts. Ancient Egyptian scribes were writing with a reed stylus with sliced sharp or metal point. The text was usually written with black ink made of soot, water and a gummy substance, while the titles and initials were usually written with red ink made from red hematite (red iron oxide) and vermilion (red mercuric oxide). Unlike cuneiform scrip writing and reading of which remained limited to the social elites, the hieroglyphs eventually became used by wider population. However, since hieroglyph writing on papyrus required a lot of patience and precision eventually developed simplified form of hieroglyphic writing known as the demotic (popular) script used by wider population, while the priests wrote in hieratic (from the Greek word for priestly) script, a cursive writing system which also allowed faster writing but was used exclusively for religious texts.